In the drive to advance wireless communication, researchers at The Ohio State University’s ElectroScience Laboratory are exploring the concept of miniaturized “hovering” antennas. Electrical and Computer Engineering Assistant Professor Nima Ghalichechian (pictured) and his team of students just won a three-year $300,000 National Science Foundation (NSF) grant award from the Division of Electrical, Communication and Cyber Systems. In simple terms, the NSF research could help take wireless communication systems out of the crowded microwave frequency and into the wide-open millimeter-wave spectrum. Ghalichechian said the funding will go toward their proposal, “Suspended high-gain millimeter-wave antenna arrays: Hybrid fabrication using MEMS and 3D-printer technologies,” which explores the creation of efficient integrated circuit antenna arrays. According to their proposal, more than 100 times bandwidth is available in the millimeter-wave spectrum of 30-300 GHz, offering the potential of huge increases in data rates for next generation devices. Rather than being constructed on top of a traditional silicon substrate, Ghalichechian said, the proposed antenna arrays are essentially suspended on the air above the antenna. “Think of it like a diaphragm supported by small posts, but it’s mostly floating. The idea is to physically isolate the antenna from the lossy substrate. Suspend it in air,” he said. 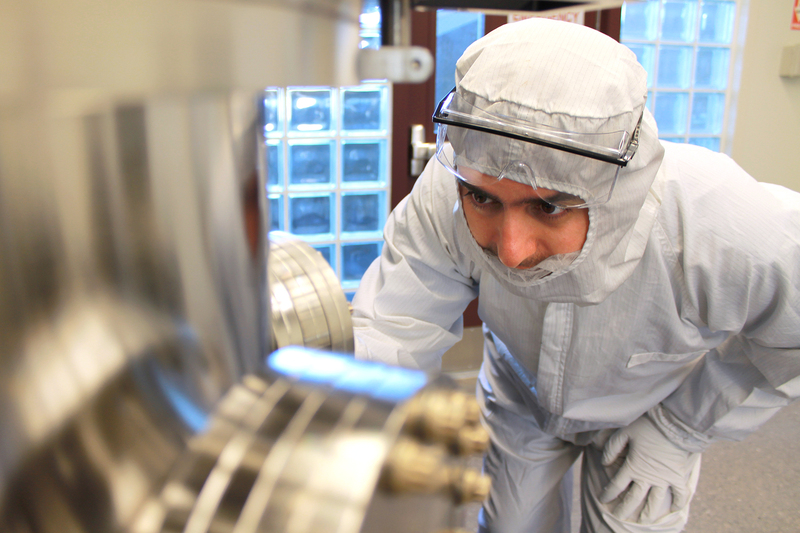 He added that silicon substrate at the millimeter-wave level is prone to losses. “(Silicon loss) is an old problem that has been lingering around since the 1990s, but nobody has proposed a viable solution,” Ghalichechian said. According to the proposal, this research aims to understand and address fundamental limitations in efficiency of integrated circuit antennas and arrays. By suspending all radiating elements of a phased array in air using MEMS fabrication processes, the losses attributed to silicon are mostly removed. “The central objective is to develop scanning arrays on silicon integrated circuits that exhibit radiation efficiency of greater than 85 percent. Such compact high-efficiency millimeter-wave arrays have not been realized to date,” the proposal states. Another aspect of the project is to use new 3D-printing technologies to create lens structures above the antenna. Graduate students Jiantong Li and Kyoung Ho Jeong are currently working toward realization of the high-efficiency millimeter-wave antenna and lens structures, respectively. Aside from drastic increases in wireless bandwidth, applications for the proposed arrays include millimeter-wave short-range communication links, satellite communications, radars, remote sensing, security and medical imaging. The NSF grant also will support curriculum development at Ohio State in the area of RF microsystems at ECE and ESL. Ghalichechian will advise undergraduate researchers through projects and independent studies intended to harness the unique features of millimeter-wave antennas. Ghalichechian’ s RF Microsystems Laboratory hosts up to three undergraduate researchers every year.